Our GC-IRMS solution provides a significant step forward in analytical performance and capability. Harnessing the combined power of the Thermo Scientific™ TRACE™ 1310 GC, GC IsoLink II™ preparation device and the ConFlo IV™ reference interface with our powerful Delta V™ isotope ratio MS at its core, builds a seamless solution to meet the analytical challenges of today’s rapidly expanding isotope ratio world. 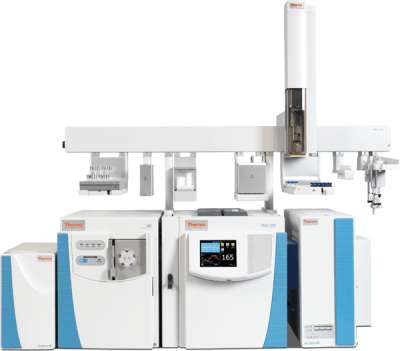 The system can additionally incorporate any benchtop MS from our portfolio of GC/MS technologies. From a single injection, the identity and isotope ratio of each target compound can be qualified by a hyphenated GC-MS-IRMS System. Concomitant data is essential or even mandatory in a court of law to qualify the true identity of a compound. The combination of IRMS and quadrupole MS hyphenated to a single Trace 1310 GC provides vital complimentary information. From a single injection, the structure and isotope ratio of each compound can be determined. In challenging matrices, identification of minor components masked by dominant co-eluting compounds brings major uncertainty in data confidence. Isotope ratio MS is an invaluable tracer for identifying these minor and unknown components, allowing unambiguous compound identification in data simultaneously generated from a full GC/MS scan.